Rovinj, Croatia — the jewel of the Adriatic — has a distinct feel more Italian than Central European. That’s because Venetians ruled Istria for centuries in northwestern Croatia just across the Adriatic Sea from Venice. Today, it’s a perfect laid back destination for savvy travelers looking for sun, water, and great local food and wine. While you can’t bottle the sunshine, just about everything else that makes Rovinj so attractive is available to take back home with you when at last you part. You’ll find unique and beautiful apparel, trinkets, food items, liqueurs, and other souvenirs from Croatia that are made in Rovinj and northern Istria. While we’re not huge shoppers, we do love hunting for a unique item or two to bring home from our travels. In Rovinj, shopping turned out to be a lot of fun. We love locally sourced food items and finding the works of local artisans. It’s part of the adventure that’s possible through slow travel — supporting the community that we’re visiting by buying local handcrafted items versus mass-produced stuff from somewhere else in the world is a philosophy that we promote. It’s not always easy to tell we know, and sometimes hard to find out. But if you chat up the shop owner and ask market vendors what’s locally produced, you’ll usually find what you’re looking for. Artists and producers love to tell their story, and we love to listen. This is why we travel, right? To learn about other cultures and what they grow to eat and drink. Try it. Ask someone what they like for breakfast and you’ll learn that and no doubt a whole lot more. 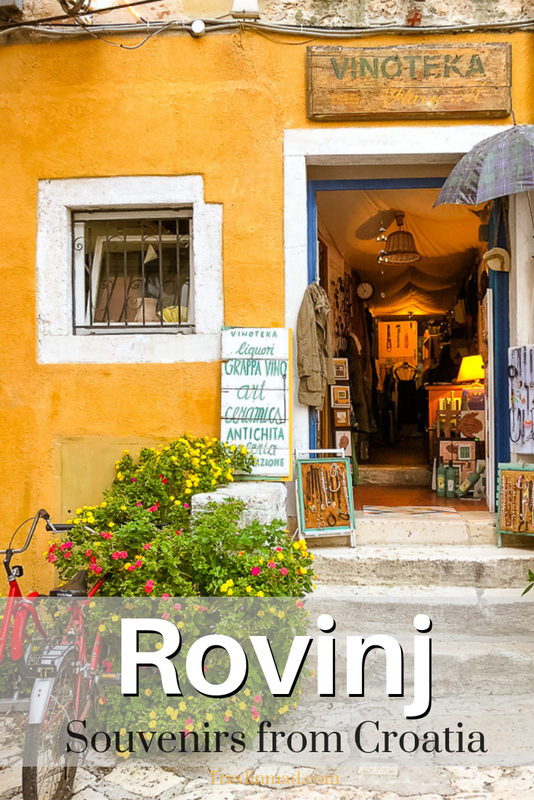 So when you visit Rovinj shopping the cobbled streets of Old Town, look for artisans selling their original creations and wine shops selling Istrian wine, liqueurs and olive oils. Here are our favorite unique things to buy in Croatia that are unique to Rovinj and Istria. 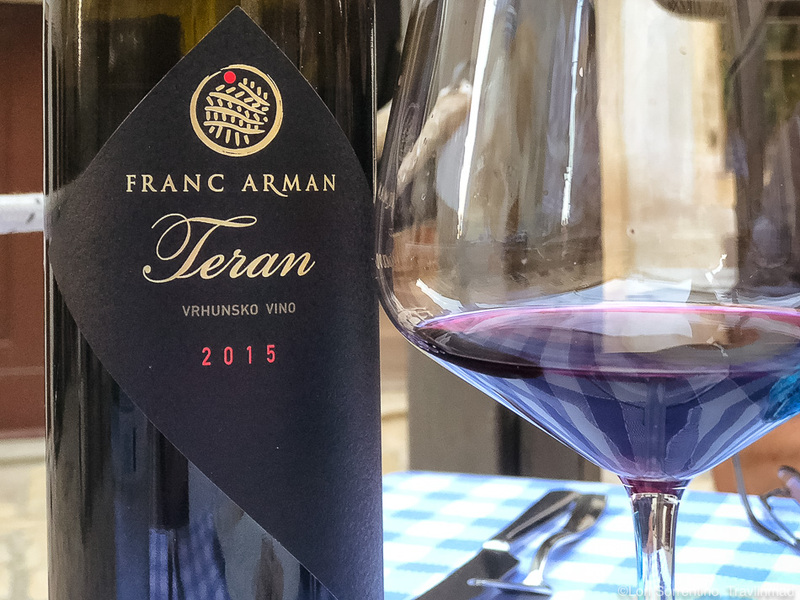 The mild climate and breezes coming from the Adriatic along with ideal soils for growing wine grapes have made the Istria Peninsula a star producing some of the best Croatian wine available. While in Rovinj we lucked-out and were there during the annual wine festival. 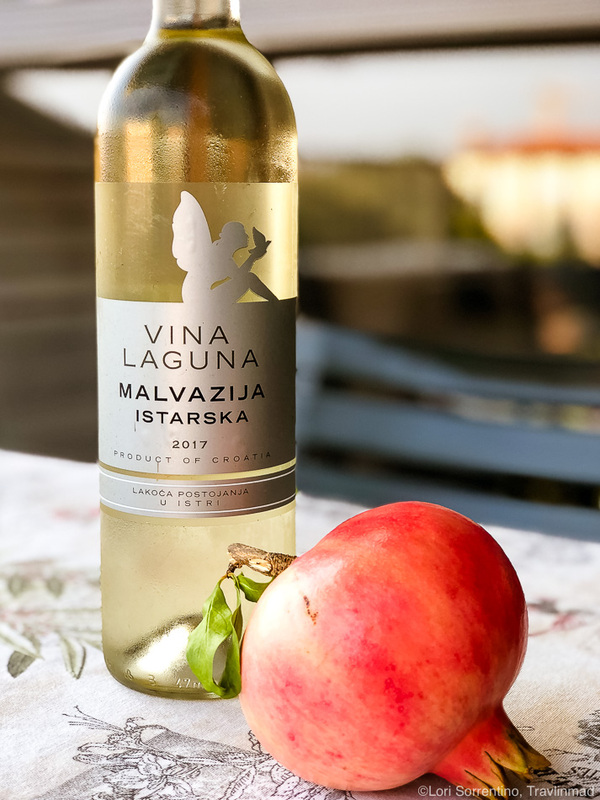 Vineyards are producing an incredible number of both red and white varietals, but our favorites were the Malvazija, a delicious white Istrian wine, and Teran, a full-bodied dry red from western Istria. Don’t worry if you missed the wine festival. Several operators in town offer tours of the surrounding wineries. We couldn’t believe our good luck at stumbling upon this great little enoteca (wine shop) called Shop Tomaso. Shop owner Tomaso sells local wines, spirits, and olive oil, and happily tells you about them and offers tasting of most items. But Tomaso has a very cool rock-and-roll past (and the photos to prove it) and it’s great fun to talk with him. The stories he can tell! We chatted with him for about an hour, tasted some Istrian olive oil, Istrian wine, and toasted with some Teranino. And of course a bottle of Teranino came home with us. Another great little wine shop selling the best wines to be found in Istria along with Istrian specialties like liqueurs, olive oils, truffles, some local ceramics and more. As the name suggests, you can indulge yourself with an inexpensive generous tasting that’s free if you buy a bottle of wine. Not bad and well worth a stop. 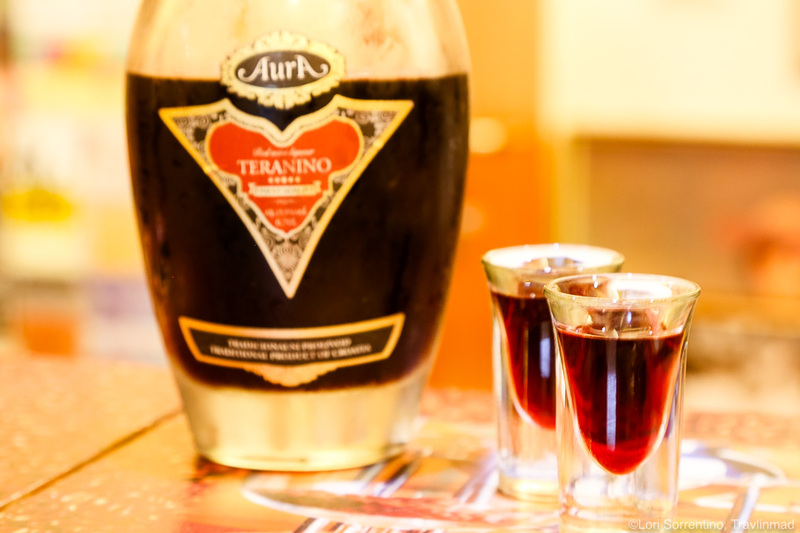 Teranino is a very popular Istrian liqueur and without question our favorite. It’s made from Teran red wine with a secret blend of fruits and spices. It’s sweet, but not too sweet, feels rich and smooth, almost decadent. If you give it as try, our favorite brand is Aura. Rovinjski Pelinkovac is a locally produced herbal liquor known for its unique, bitter taste and strong smell of wormwood. Made from the Artemisia herb, commonly known as wormwood, it has a strong aroma and distinctive quality, and a heavy alcohol content to boot. It’s served warm or cold as an aperitif or mixture, but it’s definitely an acquired taste! Sljivovica is made from plums and is a good example of Rakija (Rakia), a very strong type of brandy made from various fruits especially from grapes. We first tried homemade rakija in Slovenia, and it was similar to the ones we tried in Croatia, usually clear but often is infused with various herbs. Treat this one with care. At 40% or more alcohol, it’s potent stuff. You can leave Rovinj and take a tour of the ‘olive oil roads’, since the best olive oil in Croatia is produced right here in Istria. If you haven’t the time or you’re just not in the mood to take another tour, take that walk through Old Town. Istrian olive oil is some of the best in the world and there are any number of shops where you can taste and buy some to take home. Be sure to check out the open air market, kind of a farmers’ market, for some off-brand locally produced olive oils that you can taste and compare. Looking for a unique Istrian souvenir to bring home? Truffles (tartufi) might just be what you’re looking for. These culinary gems can be found in shops throughout the town. There are oils infused with truffles, truffle cheeses, truffle spread, whole truffles in jars, and truffle seasonings. At night when the restaurants are in full swing the aroma of truffles is inescapable. If you see a tartufata (a truffle, mushroom, garlic, olive oil combo) pasta dish on a menu, give it a try for the taste and aroma of Italian influenced local flavors. 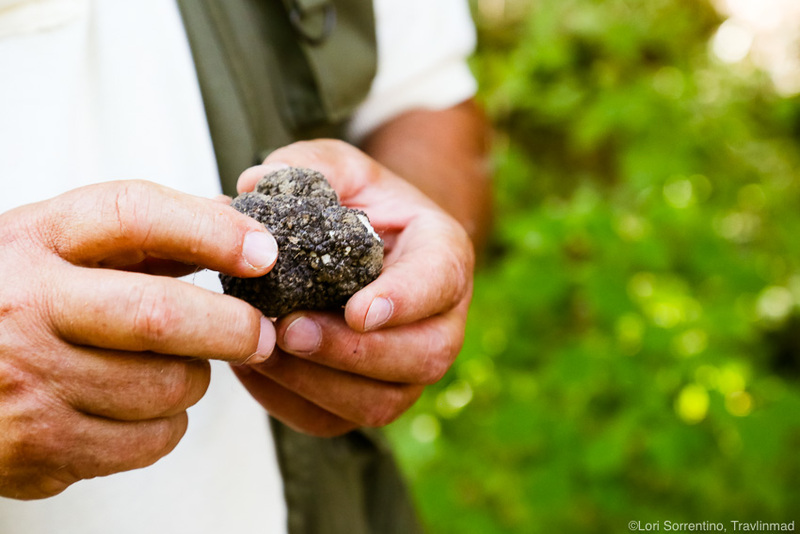 Truffles are an acquired taste but if your taste buds agree, you’ll be hooked. We even had a pizza with shaved truffles as a topping and it was pretty incredible. 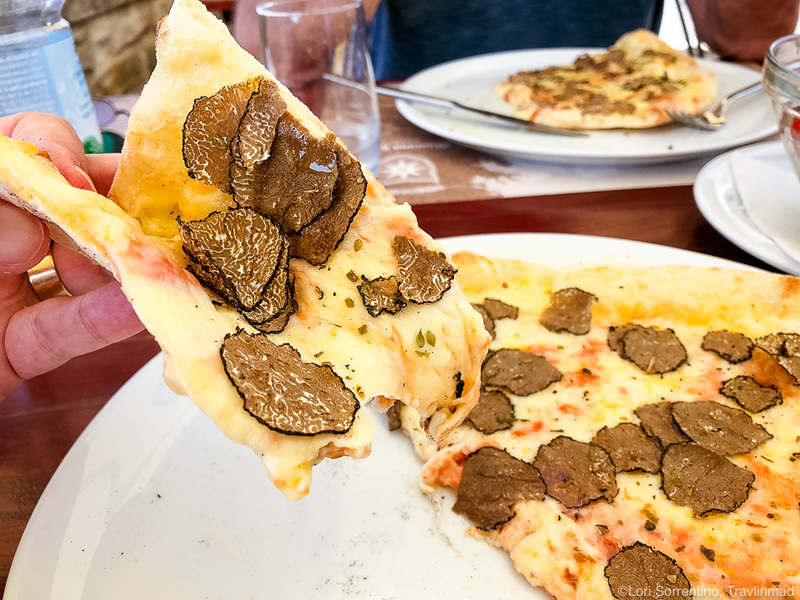 For a unique experience in Istria, book a truffle tour like the one we went on in Emilia Romagna — such a fun and interesting farm-to-table foodie experience. You might catch whiffs of lavender all around Rovinj, as this ultra fragrant herb is grown throughout the Istrian peninsula and seems to be everywhere in town. Who knew? Small kiosks selling nothing but and shops with everything from bouquets of the dried flowers, sprays, all sorts of lavender stuffed things like little pillows or animals to infused oils and soaps. Most people are usually so caught-up in wines and specialty foods that something like honey doesn’t usually get noticed as a specialty. 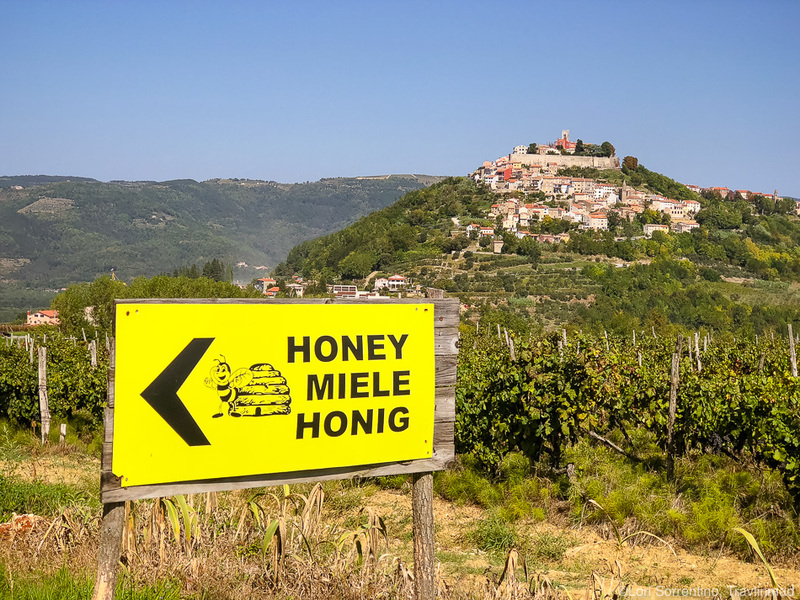 You can taste Istrian honey at several places in town and in the open market. Honey gourmets will love the variety, for example, acacia, lavender, and chestnut. There are flavored honeys, herbal honeys, liqueurs, and cosmetic products. Folks in Rovinj love their honey and tasting it is sweet fun. We live at the beach and it seems to be more and more difficult to find pieces, even small pieces, of driftwood. Thankfully we found a treasure trove in Rovinj. What a pleasant surprise to find shops selling small souvenir type things like knick knacks and driftwood magnets to more elaborate works of art made with driftwood. Now if only we could figure out what to do with all the plastic trash making its way into our oceans. But wait……. Local artisan Tatjana Rokvić of ArtRovinj creates quirky and whimsical art recycled and repurposed from trash, which is not only beautiful, but makes you feel good about buying it too. We had the pleasure of chatting with her and were amazed at what she creates from mostly things that have washed ashore from who knows where. Pieces of styrofoam, driftwood, an old beat up shoe, pieces of plastic plumbing pipes, and even a broken scuba mask and snorkel all painted in whatever colors she is feeling at the time. See something you like but worried about stuffing it in your luggage? No worries, she’ll ship it for you. If the lighter side of art is not what you you’d like to take home, there are several fine art shops with original paintings and beautiful unique jewelry pieces in Old Town. Often the artist is in the shop and can help you with whatever questions you might have about their works. Atelier Sottomuro is one such shop and if you’d like something more high end then absolutely include this shop during your visit. Even if you don’t make a purchase, wherever we stopped we found the artists friendly and enjoyed hearing about how they wound-up in Rovinj. Sometimes we don’t see anything by an artist that says ‘buy me’, and sometimes it’s just not in the budget. It doesn’t stop us from looking though, and sometimes we come across beautiful local crafts. These can have a broad price point and maybe don’t seem quite as refined, but if done locally they can make great inexpensive gifts and souvenirs. In our wanderings we discovered Ribica Atelier, a really fun little craft shop that fits the bill for authentic gifts to bring home. They have some very cool ceramics, textiles and small paintings. There’s something here for everyone and they’re super friendly, even if you just want to browse. You’re in Rovinj and the warm sun, aqua blue Adriatic, and slow pace are calming your spirit. When the relaxed ‘la dolce vita’ vibe sets in (and it won’t take long), you feel compelled to look the part, and the quaint boutiques and cool clothing shops can outfit you in long flowing sundresses or a comfy linen men’s shirt, the perfect lightweight scarf, hat, or jewelry to look the part, and the casual accessories to go with it. We weren’t looking for clothing in particular on our trip, but as we walked around for several days, I kept seeing the same black and white image on a t-shirt in shop after shop. We usually don’t spring for the been-there-done-that t-shirts that scream “I went to Croatia!”, but there was something very John Wayne rugged about the face on the t-shirt I kept seeing. As we stared, the shop girl asked if we were fans of Bud Spencer, informing us he was a famous American cowboy. Well that was news to us Americans and lovers of Westerns. So we asked the Google gods more about him when she came up blank. Carlo Pedersoli was indeed a famous actor/cowboy — though Italian — who starred in several Italian-American spaghetti Westerns of the 1960’s (think Clint Eastwood). I still wish I would have bought that shirt! “Take with you the fragrance of Rovinj” is the slogan of this lovely shop. While perfume is such a personal choice, Profumo di Rovigno has some really heavenly scents in other products besides perfume — fragrances for both women and men, bath products and body lotions, soaps, sprays, sachets, room diffusers, and oils, the heady scents range from light and fresh to heavier, and more exotic fragrances. Everything here is beautifully presented and packaged, for those things that are going home with you as gifts. Like many places famous for leather goods (Florence, Italy comes to mind), it’s a “buyer beware” market. The best deal or lowest price won’t always give you the best quality. That’s true here as well. Want quality? The premier shop in Rovinj is Koza. We had heard nothing but good things about the place, and it was a shop we had to visit. Handbags, belts, and small purses are all handmade. Their main location is in Zagreb but the same high quality leather, excellent craftsmanship and friendly accommodating service are right here in Rovinj as well. Rovinj is special, the pearl of Croatia. We had no idea that it would be so charming and at the same time offer such a vibrant local food scene. Souvenirs and gifts for every budget can be found throughout Old Town. All this and without the tourist crush found in Dubrovnik and the other major cities on the Dalmatian Coast. When you decide to go, check the calendar for their list of events and festivals — there’s a festival for just about every interest. Shoppers and local art lovers will especially love the annual Grisia Open-Air Art Exhibition, during the 2nd Sunday in August. Rovinj is easily reached from the Zagreb Airport or as an added stop to a northern Italy itinerary, and should make the cut of your bucket list this year. So take your time, visit as many shops as you have a mind to and take home some of Rovinj’s special souvenirs.